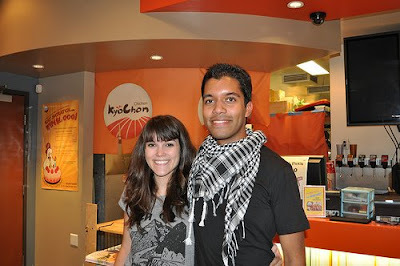 Abby and Shevin initially bonded over their mutual love of boba during their freshman year at USC and have since been together and enjoying all of LA's wonderful culinary offerings. They both love to travel, explore, and most importantly eat! It seemed like a great idea for FoundTrack to introduce a food column. Let's face it, those of us who enjoy art, film, fashion, and music usually have a soft spot for great dining experiences as well. So now, these two young Angelenos will have the chance to share some of their favorite tasty spots in LA with all of you fun people through Foodie Fridays. If you have any recommendations you think should be considered for the column, plese send an email to foodiefridays at foundtrack dot com. Eat on! 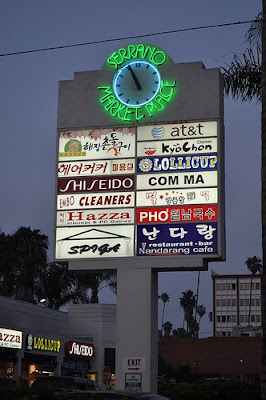 When most people think of Korean food in LA, they probably envision images of raw meat sizzling on a table-top grill and the clothes-permeating smoke that comes with the experience. But that's not the only game in K-Town. Just as they took a culinary stalwart like BBQ and made it their own, the Koreans have improved upon another all-American meal: fried chicken. 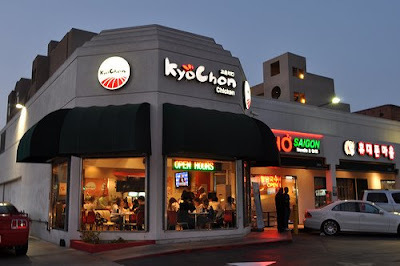 While several Korean fried chicken joints have popped up around town, the most popular is the American branch of the Korean chain Kyochon, located in a mini-mall on 6th Street in the heart of Koreatown. If the thought of deep fried chicken for dinner isn't enough to make you fear the post dinner "food baby", the help yourself soft-serve machine will. Conveniently placed by the queue, the machine stares you down while you wait to order; suddenly McDonalds and Carls Jr. seem like low-fat alternatives. I (Abby) certainly cannot resist the temptation of the ice cream appetizer. It reminds me of the bad habits I had growing up as a chubby kid. (Look mom, can't stop me now). Shevin also enjoyed the tasty pre-dinner treat . Here, Shevin, Foodie friend Ben, and I very carefully scour the menu in search of the best combo.... a whole chicken, cut up, and fried twice. The flavor? Half "original" and half "hot". I (Abby) always contemplate ordering something new, but can't help but revert to this go-to special, it's just too yummy to risk venturing on to a new dish. Be warned: those who enjoy the mild, inoffensive flavor of the Colonel's recipe will go into anaphylactic shock. 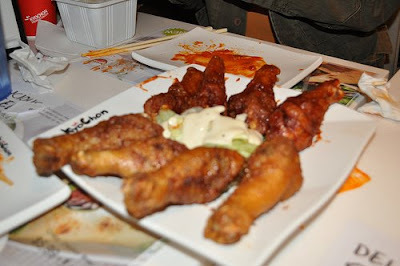 Korean cuisine has never been known for its subtlety, and it's no exception at Kyochon. There are two primary flavors of chicken here: The modestly named "Original" flavor is an explosion of garlic, soy and a litany of other herbs and spices that get the synapses firing in your brain and make you wonder how fried chicken can be so complex, so flavorful, and so addictive. The "Hot" flavor is equally delicious and certainly not for those who can't handle their spiciness. It starts off with a delicate sweetness that crescendos into some serious eye-watering heat that can only be satiated by eating more chicken. So what's the secret to their process? Well, we certainly will never know the exact combination of herbs and spices that are deep-tissue massaged into the chicken, but we do know that they fry the chicken twice. Yes, those holding Oprah vouchers should know this is not health food. That being said, the texture is relatively un-greasy and wonderfully crispy. When one orders a whole chicken at Kyochon, it's chopped up into little bite size pieces making it easy to eat on the road since you won't be able to wait till you get home as the smell fills your car. One can of course order just wings or drumsticks if that's more your thing. With all but the smallest orders, you can opt to get it half-and-half so you can try both flavors. 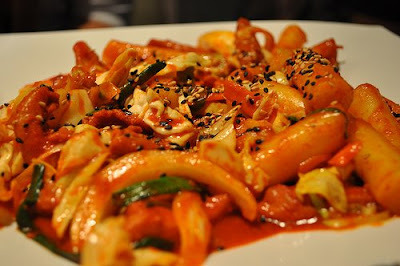 The chicken is the main event, but Kyochon does offer a few other entrees for those looking for their carbohydrate fix. These choices include chicken fried rice, chicken bulgogi, and chicken with rice cakes stir-fried in a spicy sauce (our favorite). Also, we recommend the $1 radish pickles that work as palate cleansers between bites. Service is helpful enough but not effusive. Also, be prepared to wait. Everything is fried to order so a whole chicken usually takes about 20 minutes. The decor is bright and clean and charmingly lost in translation. 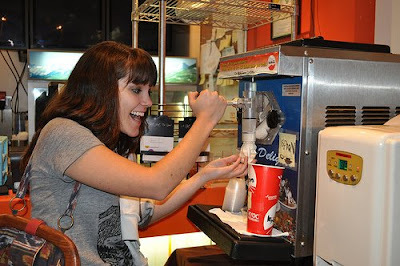 I've never encountered a restaurant before that offers free soft-serve ice cream while you wait for your order, but it certainly beats a hot towel. Save up an appetite so you can really enjoy. 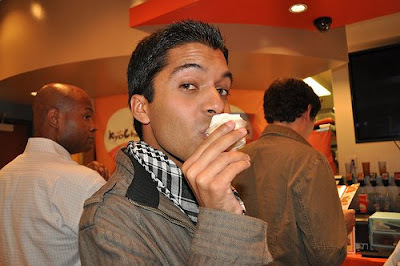 If you're still hungry post-chicken, there is an awesome boba tea place next door that we highly recommend. 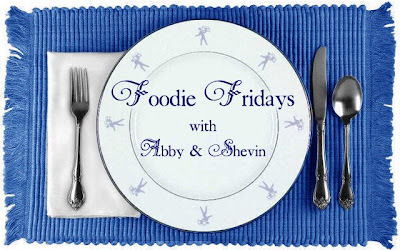 NEXT TIME on Foodie Fridays: Special Abby's Birthday edition from Guelaguetza... holy mole!